Carnival Cruise Lines have announced that they will be bringing a second ship to the port of New Orleans, bringing capacity levels back to pre-Hurricane Katrina levels. Both the Carnival Ecstasy and the Carnival Conquest will be repositioned to the port, operating year-round departures which will begin in Autumn next year. With the positioning of these two ships, it is expected that Carnival will carry around 340,000 passengers each year from New Orleans. This is the highest amount out of all the cruise lines. The two ships are currently based at Galveston port, and obviously the repositioning of these ships will leave Galveston empty. 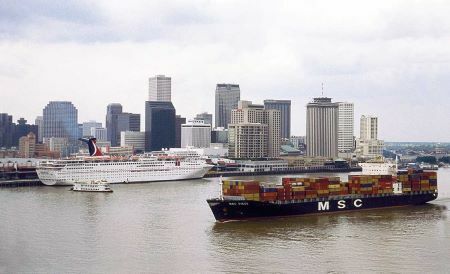 However, it is expected that the Carnival Triumph will be moved to Galveston when the Ecstasy and Conquest arrive in New Orleans. This will allow Carnival to operate year round Caribbean cruises from Galveston beginning in Autumn 2011. The itineraries of the ships will be mainly based around the Caribbean, offering 4 and 5 days cruises onboard the Carnival Ecstasy, and 7 day Western Caribbean cruises onboard the Carnival Conquest. The Conquest is renowned for it’s huge range of on board facilities and activities, including a massive 22 lounges, bars and nightclubs. It also has four restaurants and a huge spa, health and fitness facility. The Carnival Ecstasy also hosts a huge variety of entertainment, activities and facilities. It has a recently renovated, 12,000 square-foot spa, dancing halls, a theatre and a jogging track for those wishing to keep fit while they are on their holidays. Let’s face it, with the three spectacular restaurants onboard, a bit of exercise would certainly be recommended!